In the Folk-Lore of the Scottish Highlanders there is no chapter more extraordinary or interesting in its way than that which deals with the stories of the Second-Sight—a "gift," notwithstanding the ridicule of the unbelieving, that to the present day, in one or other of its manifestations, is not uncommon among the Highland people. There is no doubt that much of the merely traditional has gathered around the subject, but there still remains so considerable a body of well-authenticated facts that they deserve the closest study of Folk-Lorist and Psychologist alike. As facts, they certainly challenge enquiry and invite elucidation. It is hoped that the following pages will, therefore, prove as helpful to the serious student as, it is believed, they will be welcome to the general reader—not in the light of the superstitious or the merely curious, but as a subject of particular interest in view of present-day res3arch in matters psychological. The introductory study from the pen of the Rev. William Morrison, M.A., F.S.A. (Scot. ), minister of the United Free Church of Duthil, should prove a valuable contribution to any enquiry into the nature and psychology of the "gift." The references to the Second-Sight which are to be found in the principal early writers on the subject, as given in pages 25 to 95 inclusive, are here for the first time brought together in convenient form. The remaining pages deal with some modern instances known to the present writer, together with the well known "predictions" of the Brahan and Petty Seers and those remarkable instances from the "Minister of Killearnan" written by his gifted son, the late Rev. Dr Kennedy of Dingwall, whose name and authorship must be taken as conclusive testimony to their genuineness. 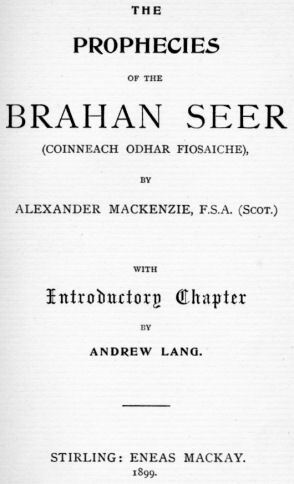 The Editor acknowledges his obligations to Mackenzie's "Prophecies of the Brahan Seer" and Maclennan's "Petty Seer" where quotations have been made from these works, and in this connection also he has to acknowledge his indebtedness to Mr R. J. Gillanders, Rosemarkie, and Mr Donald Macdonald, Dingwall, for kindly assistance in elucidating facts regarding the Brahan Seer and several of his prophecies, and to Mr John Maclennan, Dingwall, for supplying information in connection with the instance of the Second-Sight recorded on page 101.